If you want to bake a batch of cookies with butter flavored shortening, here’s a recipe. 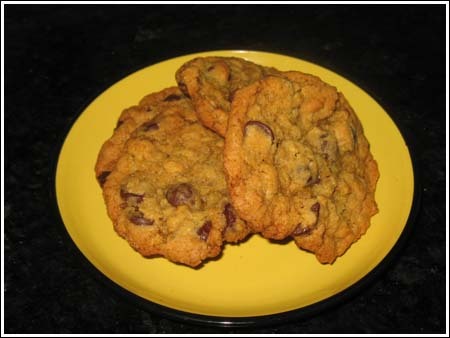 Oatmeal chocolate chip cookies made with shortening. In a large mixing bowl, beat shortening and sugar with an electric mixer until creamy. Beat in molasses, egg and vanilla. Stir together flour, baking soda and salt. Add flour mixture to butter mixture and stir until incorporated. Stir in oats and chocolate chips. Chill dough for 1 hour for thicker cookies, or bake immediately. To bake, preheat oven to 350 degrees F. Form dough into 1 ½ inch balls and arrange 2 inches apart on ungreased cookie sheet. Bake for 12-13 minutes. Cool 5 minutes. Remove from sheet and cool on rack. I haven’t tried it, though. Also, the recipe I’m using is topped with whipped cream. Kraft has some excellent recipes — a bunch, actually. I wanted to make a scratch version first, but I suspect some Jell-O pudding versions will follow suit. If I make the scratch version, I can compare the two. My husband loves coconut cream pie. I have made one every Thanksgiving and Christmas since I met him. I finally perfected the recipe when I used cook & serve vanilla pudding…lol! So much easier than making a pudding. I’m still working on getting the meringue to not weep…any ideas? I seal it to the edges but it still weeps at times. I had those cinnamon chips once. Unfortunately, I ended up eating them all straight from the bag before I could make anything with them!